If you like a local company make sure you like their Facebook page. It is a great way to find deals like this Mr. Sparkle deal in Lexington. Here's a new deal!! Use this status for $3.00 OFF our Wheel&Tire package (Southland Drive) or our 14.00 Works+TireBlack package at Richmond Road. This offer expires Feb 22, 2013. 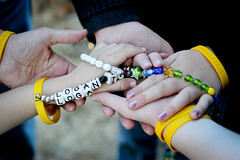 Love you All!! What did you get for FREE today? 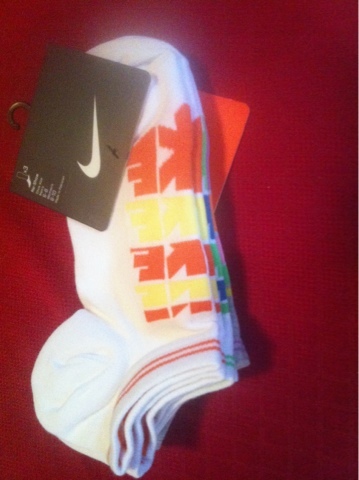 I got these Nike socksFREE! I will give them to my shoe crazy daughter for Valentines Day. 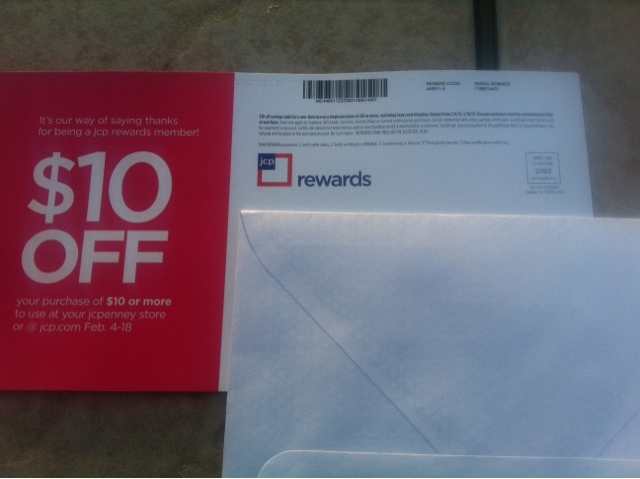 JCP sent me a card in the mail for $10 off any $10 purchase or more. If you like a company, store, restaurant, brand make sure you always ask if there is a rewards program. So often customs have no clue they might be missing out on rewards. Watch your junk mail. I got a great $10 off $10 purchase at JCP. Good Feb. 4-18. From Pizza Hut's Facebook Page. When either quarterback says, “HUT!” at the Big Game on Sunday, you’ll be able to try one of Pizza Hut’s newest creations next Tuesday 2/5 from 4–7 p.m.! No purchase necessary, one per customer, dine-in or carryout at your local Pizza Hut! Redbox is also giving us a free 1 night game rental code. To get your code, just text POINTS to 727272. This code expires February 13th! 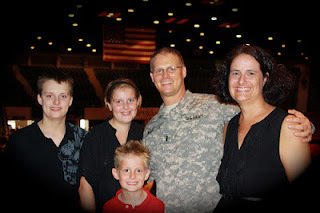 FREE Goodies for kids while their parent is deployed. If your spouse is deployed don't forget to get your FREE YMCA membership. Save 50¢ when you buy ONE (1) BOX Original Cheerios® cereal (the one in the yellow box).. Expires 2/28/2013. Save $0.50. Save 40¢ when you buy ONE (1) BOX any flavor Fiber One® Chewy Bars, Fiber One® 90 Calorie Chewy Bars, Fiber One® 90 Calorie Brownies OR Fiber One® Protein Chewy Bars.. Expires 2/28/2013. Save $0.40. Save 40¢ when you buy any TWO (2) Pillsbury® Sweet Rolls OR Grands!® Sweet Rolls.. Expires 2/28/2013. Save $0.40. Save 30¢ when you buy ONE (1) CUP any flavor Liberté® Greek or Liberté® Méditerranée® yogurt.. Expires 2/28/2013. Save $0.30. Save 60¢ when you buy THREE (3) Old El Paso® products (Excludes Old El Paso® Refrigerated, Frozen OR Soup products).. Expires 2/28/2013. Save $0.60. Save 50¢ when you buy ONE (1) PACKAGE any flavor 5 OZ. OR LARGER Green Giant™ Veggie Snack Chips.. Expires 2/28/2013. Save $0.50. Save 50¢ when you buy ONE BOX (1) Cinnamon Toast Crunch® cereal.. Expires 2/28/2013. Save $0.50. Save 50¢ when you buy TWO (2) BOXES any Nature Valley® Granola Bars (5 count or larger) OR Nature Valley® Granola Thins.. Expires 2/28/2013. Save $0.50. Save 75¢ when you buy any ONE (1) BOX Kix® cereal listed: Kix®, Berry Berry Kix®, Honey Kix®.. Expires 2/28/2013. Save $0.75. Save $1.00 when you buy FOUR (4) any flavor/variety Totino's® Crisp Crust Party Pizza® Products.. Expires 2/28/2013. Save $1.00. Save 50¢ when you buy any ONE (1) BOX Chex® cereal listed: Rice Chex®, Corn Chex®, Wheat Chex®, Honey Nut Chex®, Chocolate Chex®, Multi-Bran Chex®, Cinnamon Chex®, Apple Cinnamon Chex®.. Expires 2/28/2013. Save $0.50. Save 40¢ when you buy SIX (6) CUPS any variety Yoplait® Yogurt (Includes Original, Light, Light Thick & Creamy, Thick & Creamy, Whips!®, Lactose Free, OR Simplait™).. Expires 2/28/2013. Save $0.40. Save 50¢ when you buy any (1) flavor 32 OZ. Mountain High® Yoghurt.. Expires 2/28/2013. Save $0.50. Save 50¢ when you buy ONE (1) 20 OZ. OR LARGER Original Bisquick® OR Bisquick Heart Smart® Baking Mix, OR 10.6 OZ. Bisquick® Shake ’n Pour® Pancake Mix.. Expires 2/28/2013. Save $0.50. Save 50¢ when you buy any TWO (2) Pillsbury® Crescent Dinner Rolls (excludes Twin Pack).. Expires 2/28/2013. Save $0.50. Save $1.00 when you buy TWO PACKAGES (2) any variety Pillsbury® Refrigerated Cookie Dough.. Expires 2/28/2013. Save $1.00. Save 50¢ on (1) John Morrell meat product (Does not include whole or half hams). Expires 2/28/2013. Save $0.50. Buy 1 Truvia® Natural Sweetener (40 ct or larger), Save 75¢. Expires 2/27/2013. Save $0.75. Get $5.00 when you spend $20.00 on any Charmin®, Mr. Clean® and Febreze® products through March 28th, 2013. After all, you know you’ll need bathroom essentials, so why not save?. Expires 3/28/2013. Save $5.00. Buy any 1 Marie's® Salad Dressing, Save 75¢. Expires 2/27/2013. Save $0.75. Save 75¢ when you buy any 1 Chef Paul Prudhomme's Magic Seasoning Blend. Expires 2/27/2013. Save $0.75. Vote and you could win a FREE pizza! I voted in Papa John's Super Bowl XLVII Coin Toss Experience to win a FREE PIZZA and got 35% off any Large Pizza now.